I have nothing left to say. From now on, I’m turning a song like this off thirty seconds in, and I’m never going to pay it any attention again. You don’t have to be a blathering idiot to be country. You can let us know that you know why “(Margie’s at) The Lincoln Park Inn”, spotlighting all the moral ambiguities and complexities lurking underneath the surface of suburban America. You can even do a list song intelligently, as Tom T. Hall proved over, and over, and over again. You can celebrate the rural without diminishing the urban, trusting that the commonality of the human experience transcends the boundaries of geography. Justin Moore, you’re making Tracy Byrd at his silliest seem brilliant in retrospect. Drivel like this is making me hate country music, and I love, love, love country music. No more for me. I refuse. Ok Yall need to just back off because all of his songs are AWESOME OK. Just because ya’ll don’t know what country is, ya’ll don’t need to go around saying crap about Justin. I know him personally and if he reads this he will be so mad and upset. O and by the way the Bait a Hook is awesome. So just back off, leave him alone!!!! I echo every single sentence. I seriously don’t get why these turds are so popular these days. But I like how you made a case for it being possibly to sing intelligently about country life. At the very best, these songs do tend to make for some interesting blog discussions. Its getting harder and harder to like country music. I can’t play this garbage on my radio when its just some mindless insults at city people. And if Moore’s ex would actually dump someone because he can’t fish and doesn’t drink Jack Daniels, then she isn’t worth having back anyway. And about Tracy Byrd: at least his country-pride songs, like “I’m From The Country,” were done with a wink and a nod and an eye toward humor. You could be from the city and like his stuff. With Justin Moore, I think he might actually believe this ignorant nonsense. Oh, another one of these songs. Kevin, this is a great review. I am also so tired of these types of songs. I have lived in NYC for twenty years, but being from the rural south, I know the world that these guys write about very well. My family is mostly made up of working class hunters and fisherman. They do not go around thinking or acting the way these songs indicate. These songs are so embarrassing. Songs like this are so full of machismo and arrogance. The forced bravado reminds me of the worst aspects of rap music. Should be on a list of tips for becoming a great country songwriter. Kevin, This review only underscores your brilliance as a reflector on country music. Instead of merely bashing a terrible song, you give concrete examples of how this kind of song has been done before and much better. You’ve given me a lot to think about here. Another song I’ve always cited as the right kind of “where I’m from” song is Alan Jackson’s “Home.” He wrote it when he first moved to Nashville, feeling homesick for Newman, GA. Since it has personal meaning for him, Jackson is able to emotionally convey the lyrics. But as far as Moore goes, this is by far the worst country song of 2011. “Dirt Road Anthem,” “Country Girl (Shake It For Me)” and “Country Must Be Country Wide” are bad, but this is in a league of its own. It’s very sad The Valory Music Co let this see the light of day. And it only gets worse. Moore just filmed a video for the song. I can only imagine what that will be like. …there were times that you had to be heartbroken, on your way to san antone or listening to the radio naked to really get into the essence of country music. for the last three years or so, it seems you’d better be drunk and stoned to be able to bear the “bonfire section” of the genre. having said that – the melody is first class dance floor material. what a waste. One of the things that makes me the saddest about these kinds of songs is the manner in which I feel they’re alienating folks who, while they may not be the “typical” kind of country music fans, they could (and many already do!) still relate very much to and love this music. Yet some of these potential fans are very reluctant to give this music a chance because of the popularity and abundance of songs like these, and the messages they’re sending out, along with some people’s unawareness of the fact that this is just a small, ridiculous subset of a very large, diverse genre. I’m a WOC who’s spent my whole life in the suburbs and city of MD and DC and started receiving explict messages (some of which were identical to songs like “Bait a Hook”) from my environment at a very young age that, not only was this music not for or about me, but country folks don’t want me listening to it anyway. And therefore, I could never understand or relate to it, and had no right to listen to or enjoy it. I still hear this all the time! These messages never made sense to me because I had no problem whatsoever relating to this music due to the transcendent nature of the truth and humanity that’s at the core of a lot of it, something that was mentioned in this post. But they still exist(ed). It bugs that some people are using trivial (and sometimes non-existent) aspects of who someone (supposedly?) is to gauge whether or not they can or “should” be into a certain kind of music. But then when I hear songs like this, it’s not surprising to me that they do. Disappointing and sad, but not surprising. And I wonder sometimes if these artists and songwriters think about the messages they’re sending – ALL of the messages – and what they telling the world when they write, record, and release these songs. I wonder if they even care. I wonder if it’s their intention to send the message that if you’re not “one of us” then you can just eff right off. Disturbing, to say the least. I haven’t heard this song, but the lyrics are bad enough. After “Small Town U.S.A.” and “Backwoods,” I pretty much dismissed Justin Moore as some cynical record executive’s caricature of traditional country music. Ha, funny thing is those weren’t even my words. I copied and pasted an old comment from The 9513’s review of “Backwoods,” swapping out song titles and adding a few exclamation points. I tried, but I couldn’t come up with anything funnier than the real thing (Plus I couldn’t butcher my grammar that bad if I tried). The worst thing is that the people who enjoy these songs the most are people with poor ideas about what rural life is actually like. Here in Rhode Island, where we have a good amount of sparsely populated land but nothing that could really be called rural, I hear all the time from people who eat these songs up. But I get the feeling that anyone who was really from the kind of place that Justin Moore is from would need to flaunt it. For actual country people I imagine that life isn’t rural life, it’s just life. That’s actually a really good statement. Whoever is choosing singles for Justin Moore is, for a lack of a better word, an idiot. I’m not saying his first CD or his most recent were “good”, but there have almost always been better options. Especially on the newest, ‘Outlaws Like Me’. This is probably the second worst song on the entire CD (Sunshine Babies is probably the worst…). How it was selected ahead of songs that while not great are infinitely more serviceable lyrically is just mind boggling to me. What I’m really curious about is why the mainstream country audience and country radio feel the need to keep eating this up. How much of this is it going to take before everyone realizes they’re being had, that this is just glorified Southern arena rock with a whole lot of twang and drawl and faux-country cliches, not real-life stories? …without the video “bait a hook” is what the review implies. having seen the video, it’s all of a sudden the opposite. 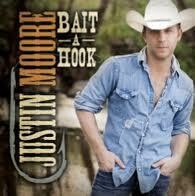 justin moore – a hillbilly with a sense of irony and matching clichés making us look slightly…judgmental? I don’t fish. So I’m like the other guy in this song. Which makes it awkward to sing along to. That being said, I can appreciate this song on a level that may or may not have been in the mind of the songwriter. The singer just lost his lady fair, and he’s naturally embittered against whoever she is with now. I can relate. I’ve been through a breakup, and I’ve had the same sorts of thoughts. “Well, you’ll ultimately miss me, because the next guy you find won’t be able to solve a Rubik’s cube or write poems like mine or …” etc. With that attitude in mind, this song becomes more of a self-pity song about a guy trying to boost his own ego after having it dashed a bit (Think Tyler Farr’s “He can’t amount to much by the look of that little truck.”) And I can enjoy that, despite my relative city-slicker-ness. The premise for this song is that Justin has lost his love interest to another guy. I think a lot of us know this feeling, and we’ve looked for their flaws and reasons why we’re a few steps above our replacement. This song shines when you appreciate it for how tongue-in-cheek it really is. Justin doesn’t mean to be taken seriously, and doesn’t want to be taken seriously–he’s perfectly happy poking fun at himself and making the listener laugh. Watch the music video to full understand and appreciate what he’s going for, I think you might enjoy it slightly more.